Right, events update. Last week I went with my roommates and some of their friends to see Live Free or Die Hard. I wasn’t going to go, and was instead going to sit at home and do the work I sorely needed to do. Man, would that have been a HUGE mistake – this movie was wildly entertaining. You see the succession of bad guys, and you just sit there and wonder, “What crazy method will Bruce Willis use to kill this guy?” Because they can’t just simply be shot unless there’s a super unimportant character. The best was when he drove over a fire hydrant and the water shot up, taking out the helicopter directly above. AWESOME. I also like Justin Long, he’s funny, and everyone thinks its so appropriate that Mac would be a computer hacker. I’ve never actually seen a Die Hard movie before, but its not like a running plot line, so blonde little me was able to make it through the subtle complexities of the story. And then it was Canada Day weekend! My mom and brother came and we ate lots of food and joined in festivities. If you do recall I have complained in the past that Ottawa is boring with not a lot going on, and that I miss Toronto. 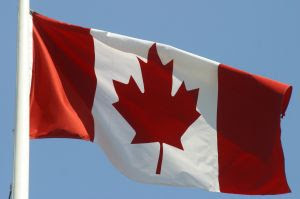 But if you’re going to be in the capital for one day in the year, make it Canada Day b/c it rocks. I’m just sad the rockingness doesn’t transfer to greater portion of the year. Ottawa is very beautiful in the summer, but all that beauty if green and trees, which does not show up in the winter and so I wouldn’t particularly say that winter-Ottawa has the same charm. 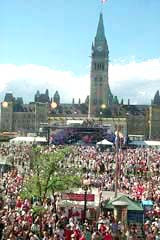 Anyway, there were people everywhere (usually the streets are empty, even on the weekends and Friday night and stuff) and there were all kinds of booths and stages on parliament hill and surrounding area. The Via rail tent was cool, b/c they gave everyone a little sapling red maple tree (hmm, I wonder why a red maple?) to plant and a balloon. I specifically requested a blue balloon even though the girl only had red and yellow in her hand, but I saw the blue ones. So we wandered around, met up with my cousins, watched a few jazz numbers and such. The fireworks were incredible. So worth the millions of Canadian tax payer dollars, dead serious. Really big, really sparkly, there were even these ones that exploded in the shape of hearts. And the crowd was really vocally reactive to the display, you could tell which ones they were really impressed by. Oooh, awww, woah! The final fireworks were these red and glittery white ones, for good ol’ Canada. My favourite fireworks have always been the ones that give off a massive *BANG* and you can feel the force of the sound in your chest, love it. Also, I got a pair of Chaco’s! For you out of the know, those are completely awesome sandals. We went to MEC and my mom found a pair that were on sale and that were my size (incredible, b/c I have issues with finding shoes the right size, they’re even womens sandals!) so now I have my very own pair. They are very pretty. But now I’ll spend a week or more adjusting the straps until they’re perfect. Now I have to catch up on the work I didn’t do last week or this weekend. I have until 2pm to get it done, either that or I have to tell my supervisor I need more time. But I did make grand promises of having everything done last time I saw him, I’m not sure why…..
Posted by R at 10:55 a.m.
ALSO i saw DIE HARD and LOVED it!!! so much fun.